The ‘SLIPS’ technology – a novel surface coating that repels almost all liquids and solids – developed at the Wyss Institute by Core Faculty member Joanna Aizenberg, Ph.D., and her team was showcased at Energy Innovation on the Hill on February 12 in Washington, D.C. The event, which attracted nearly 150 attendees including members of Congress, sustainability and energy lobbyists, members of the National Chamber of Commerce, politicians and energy consultants, showcased some of today’s leading clean tech innovators and provided a unique opportunity for them to interact with congressional policymakers and energy thinkers. 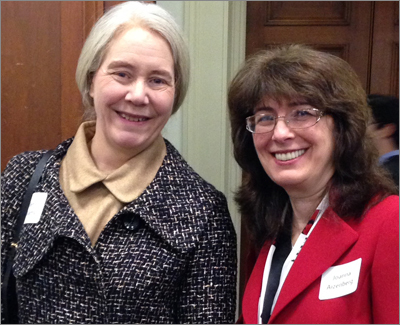 At the event, Aizenberg spoke with the newly-appointed Director of the DOE’s Advanced Research Projects Agency-Energy (ARPA-E), Ellen Williams, Ph.D. The event took place immediately after the annual ARPA-E Summit, which brings together experts from different technical disciplines and professional communities to think about America’s energy challenges in new and innovative ways. Now in its sixth year, the Summit helps move disruptive energy technologies out of the lab and into the market, which was readily apparent, as a popular theme of discussion at this year’s event was how formation of innovative energy startup companies can help stimulate the economy and drive energy and sustainability policy. During their trip to Washington, Aizenberg and her team also had the opportunity to pitch their technology to a panel of industry investors, SLIPS being one of seven technologies selected out of 130 to be presented to the panel. The Institute’s SLIPS platform was licensed out in the fall of 2014 to SLIPS Technologies, Inc., a newly formed private company creating customized, highly–repellent slippery surfaces for a broad range of non-medical applications.